For spring break April 2015, we ventured to Chattanooga Tennessee. On the first day of our Trip, we visited the Tennessee Aquarium. There are many add-on options available, including an Imax 3D movie and the River Gorge Explorer, a sleek sightseeing boat. We had seen most of the Imax movies being offered via Atlanta’s Fernbank Museum of Natural History as well as the showing times didn’t vibe with our schedule so we only opted for the River Gorge Explorer. My family was provided free tickets to the River Gorge Explorer to facilitate this review. But as always, all opinions expressed here are my own. This was a particular cold and rainy day, and we had done a lot of walking through the aquarium, so we were happy to relax in the climate-controlled cabin. The seats were roomy, comfortable and clean. There happened to be only one other couple as passengers, so I felt like we were on a VIP tour. A friend of mine visited the River Gorge Explorer the very next day, and as the weather was much nicer, she said it was a full house. 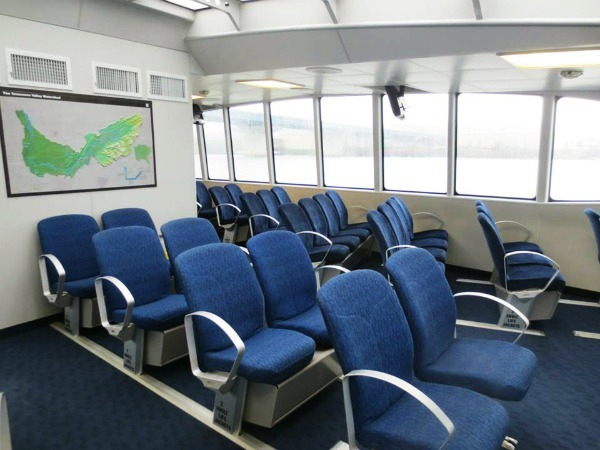 The River Gorge Explorer is a two-hour adventure cruise, led by an Aquarium naturalist (ours happened to be John) who will point out wildlife and historic points of interest along the way, as well as regale you with a little history. 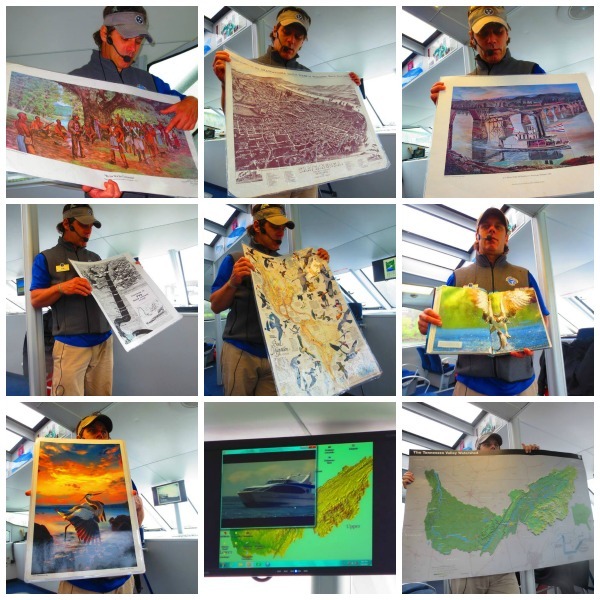 Although it was misty and cloudy, John did his best to point out as much as he could outside the boat, and he had a lot of interesting points to share within the boat via pictures, posters, artifacts, fossils, clips on tv screens, and commentary. The captain made a point of stopping the boat just to show us a live bald eagle. 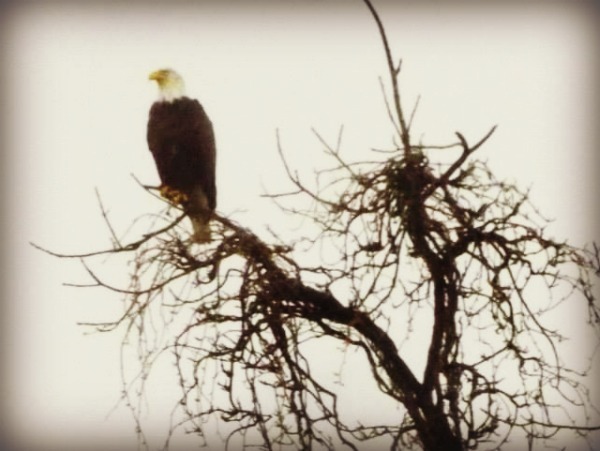 John had supplied us with high-powered binoculars at the start of our trip, but the eagle could be seen with the naked eye. It was an amazing experience to see one in person. He showed us other fauna (heron, ducks, & osprey) and flora, and even shared interesting tidbits about the buildings lining the river. He was very knowledgeable and since we were the only ones there (with the exception of another couple) he indulged my daughter’s questions and requests for elaborations. 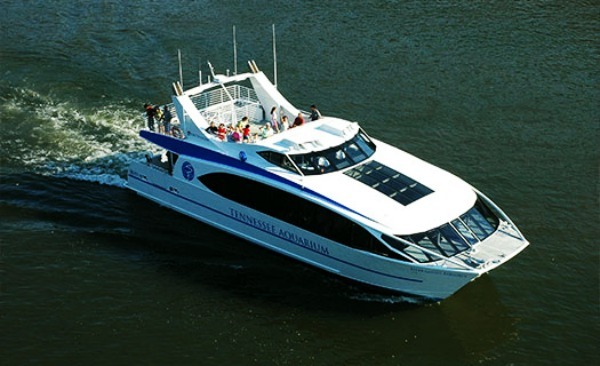 The River Gorge Explorer, is actually a high-tech catamaran, the first of its kind in the Southeast. It’s sleek design will transport you at speeds up to 50 miles per hour downstream from the Chattanooga riverfront into the scenic Tennessee River Gorge. You can enjoy the scenic beauty and wildlife through oversized windows and overhead sky panes as well as from atop the observation deck. 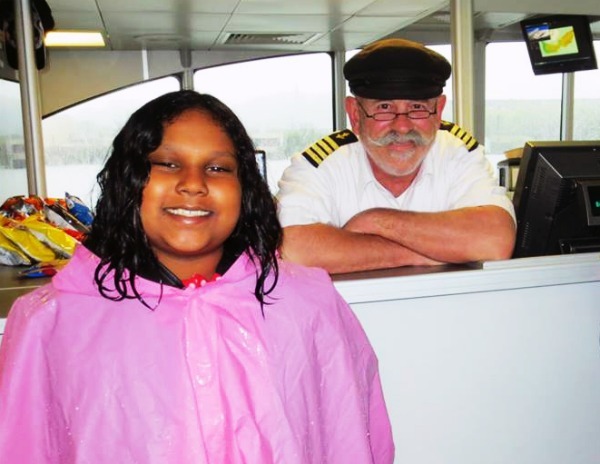 Sadly, I did not venture out on the observation deck because it was raining, and I was afraid of slipping and falling! That’s just my own cowardice, the River Gorge Explorer is perfectly safe. It makes these very hard and sudden stops at times. Time and time again, it made these stops (which was MacGirl’s favorite part of the cruise) and we survived with no incident. At the end of the tour, it does a 360 degree turn. 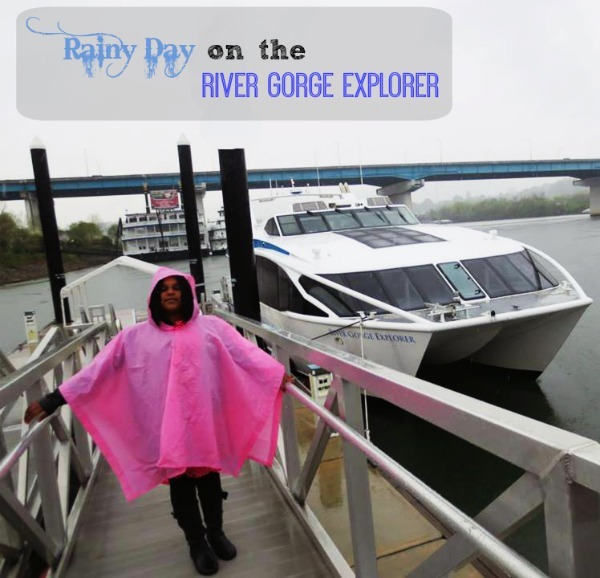 The River Gorge Explorer is a great add-on to your aquarium visit (although tix can be purchased separately). If you want to learn more about Tennessee’s history, bird watch, or enjoy peaceful scenic views, this is the attraction for you. Great post and very informative!! I feel like I needed to take more pictures when we went on it!